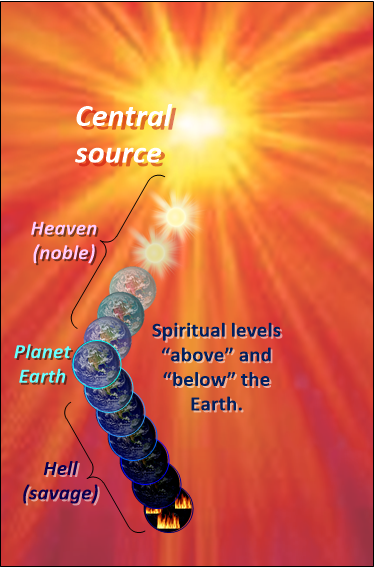 Above: The source and the Earth and all of the spirit-world-versions-of-Earth are superimposed over each other in the same space, and in this diagram we imagine that we can start pulling them apart in order to see each one, like an accordion file. The hellish realms are a little “out of joint,” and this article tries to explain why. 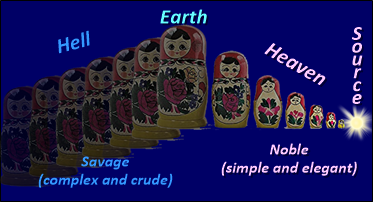 Below: Heaven and Earth (but not hell) are nested neatly inside each other like Russian nested dolls. At the center or innermost position of those nested dolls is the source (far right). Hell, on the other hand, consists of tormented worlds—flawed copies of Earth—that are rife with dark thoughts and unsavory behavior of people on Earth. The hellish realms are far removed from the source… as though they exist in Earth’s shadow and are not really part of the nested set of dolls. Again, we explore the reasons in this article. The meaning of the formula (slightly modified for this article) is: The Vitality of every entity in the omniverse is roughly equivalent to the life force that the entity Needs, in relation to the life force that it Receives). Best guess? Something is obstructing the flow of life force into those dark realms. Entities in “hell” can’t receive (R) the life force that they need (N), so they have lost their vitality(V).